Dinosaurs – little plastic dinosaurs. 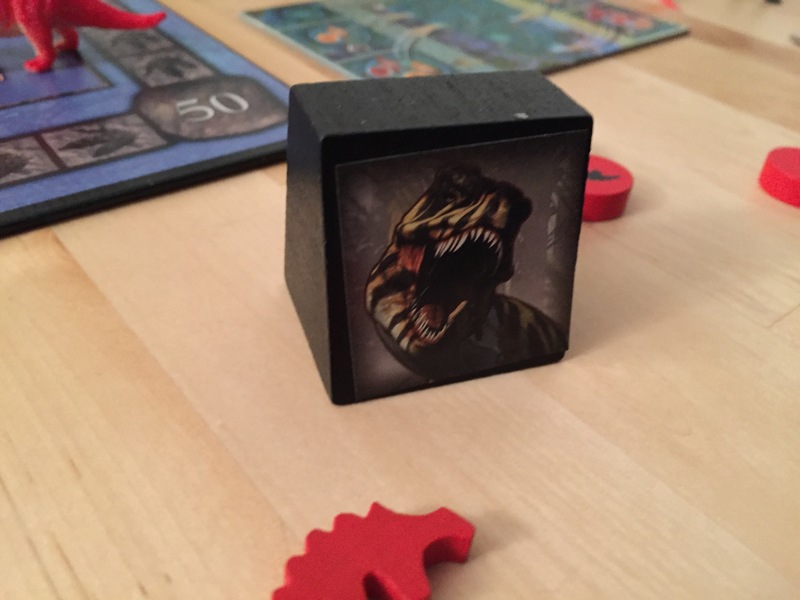 Seriously, if someone had just told me a year or two ago that Triassic Terror, designed by Peter Hawes and published by Eagle Gryphon Games, came with toys in the box to represent each player (and the ruthless predators roaming the board), I would have been all in a long time ago. 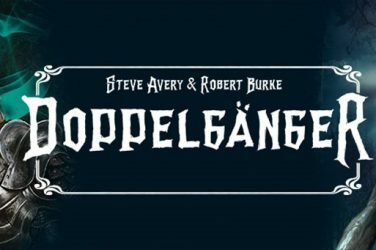 Unfortunately, I did not realize and missed out on a clever, engaging area control game that really sings with the right complement of players. 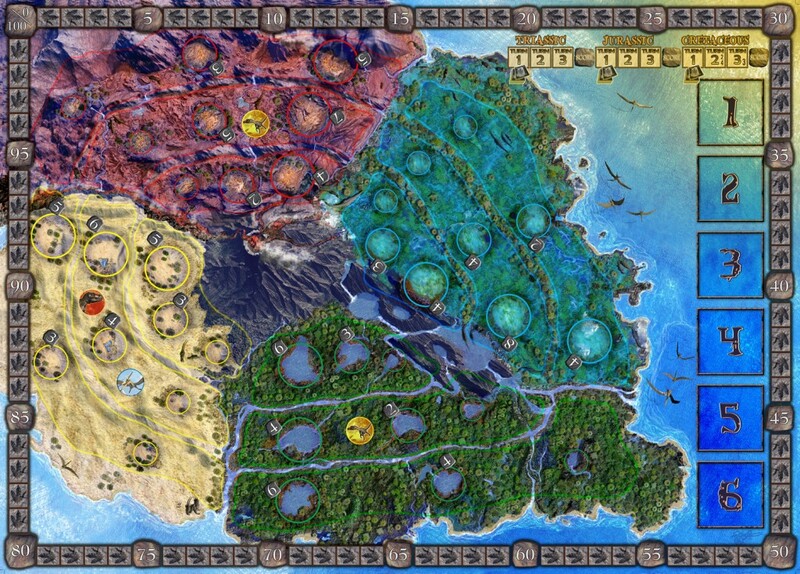 Taking place over 6-9 rounds (depending on player count), Triassic Terror takes you and your herds of dinosaurs through the Triassic, Jurassic, and Cretaceous periods, jockeying for position, breeding and spreading across the map, and strategically setting raptors and T-rexes on your foes. 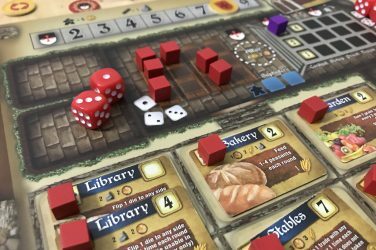 Through a half dozen plays, the game remains consistently quick and the rules are extremely accessible – teaching time has taken about 10-15 minutes at the most and a lot of the game’s rules can be learned on the fly. So let’s dig in and take a look at the dino goodness here. Triassic Terror at first looks like a very straightforward area control game. The map consists of four regions broken up into three sections each. In each of these sections there are three habitats – the Primary, Secondary, and Tertiary. The goal of the game is very simple. You want your herd to control as many of those Habitats as possible, preferably the ones with the highest point values. Each of them is labeled with a number of points you can score if you control them at the end of an Era. 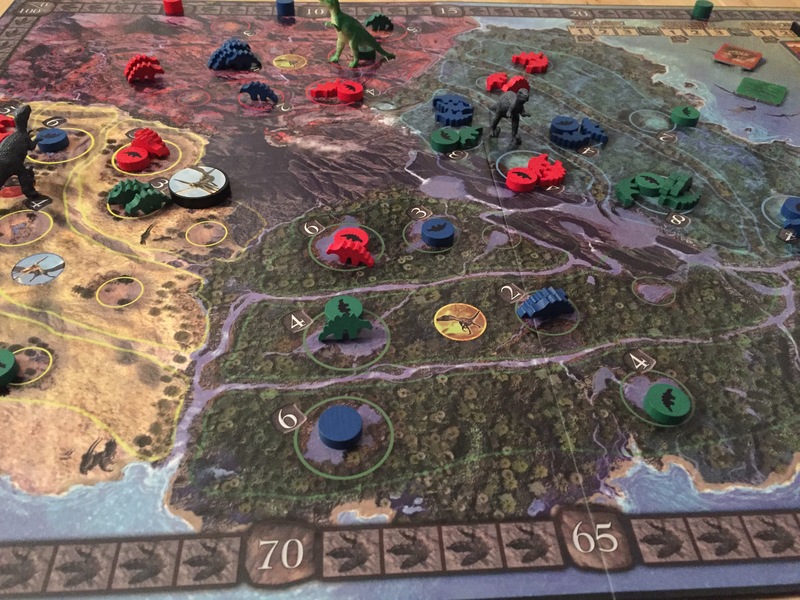 In addition, depending on player count, you may also score additional points if you have dinosaurs in every region of the board, or if you control the majority of a single region. As I said, this is a fairly straightforward area control mechanism and it works quite succinctly, because everything you need is printed right there on the board. Players will each place dinosaur meeples in their color on the board when populating, and there are discs that are worth three dinosaurs each that come into play in later rounds as you run out of meeples (which you will). The real genius of this game, though, and what struck me when I played the first time is the way in which you select your actions. 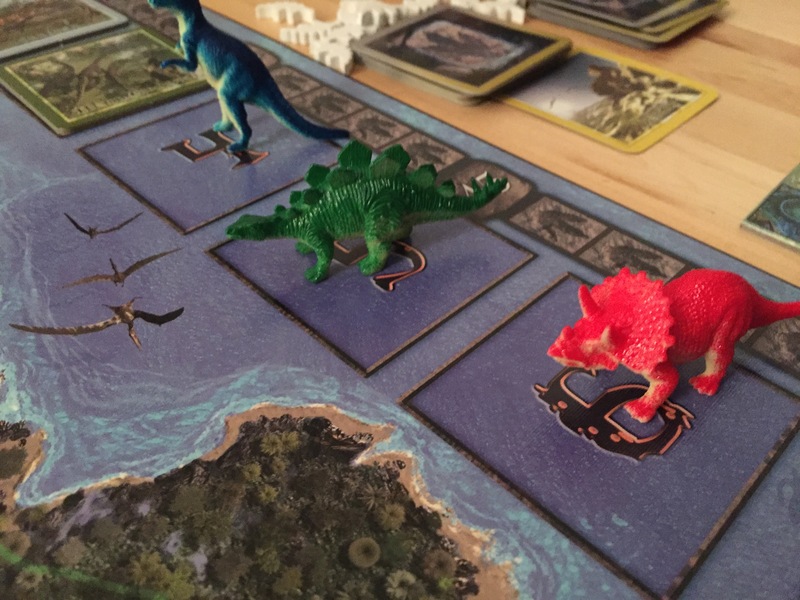 Every round, players will take turns placing their player dinosaur (a color-coded plastic dinosaur – each of them a different species), on one of 6 potential action tiles. These action tiles allow you to move your herds, increase their size, hatch additional dinosaurs into existing herds, place herds in new regions of the board, or move the T-Rex and Raptors on the board to eat other players’ meeples. Yes, there are plastic T-Rex and Raptor pieces in this game and they are spectacular. When you play these actions, you move them 1-2 spaces and then eat a number of dinosaurs of your choosing (depending on how far you move them). It is by far the most fun in the game and when someone takes that tile you immediately start counting out distances to determine if they are going to take a swipe at your guys or not. 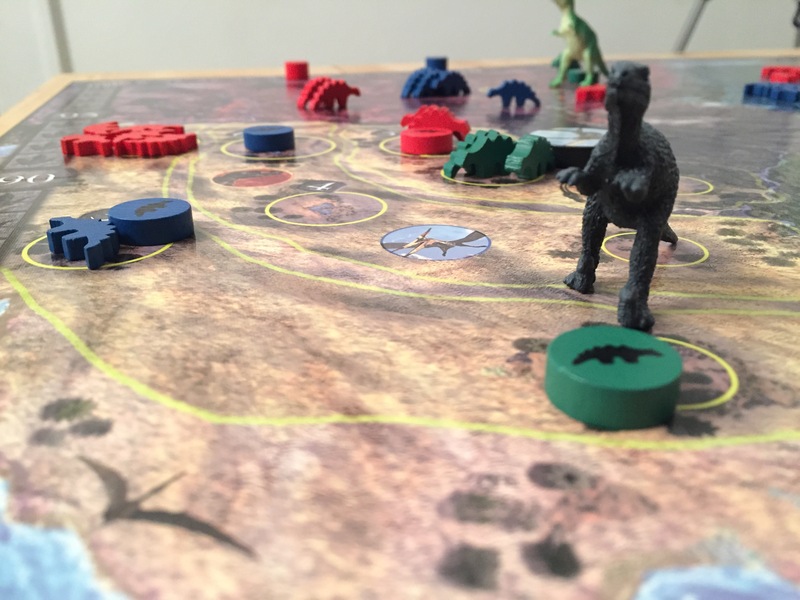 Each player also has a pair of tokens they can play once per Era – either dropping a Volcano on an area and killing off a good number of dinosaurs, or adding more dinosaurs to one of their own herds with the Hatch action. Combined with cards you’ll draw once per era to populate a new region, you’re putting out a LOT of different dinosaurs almost every time you play, which is much appreciated in a game where predators play such a prominent role. What is there not to like about this game? 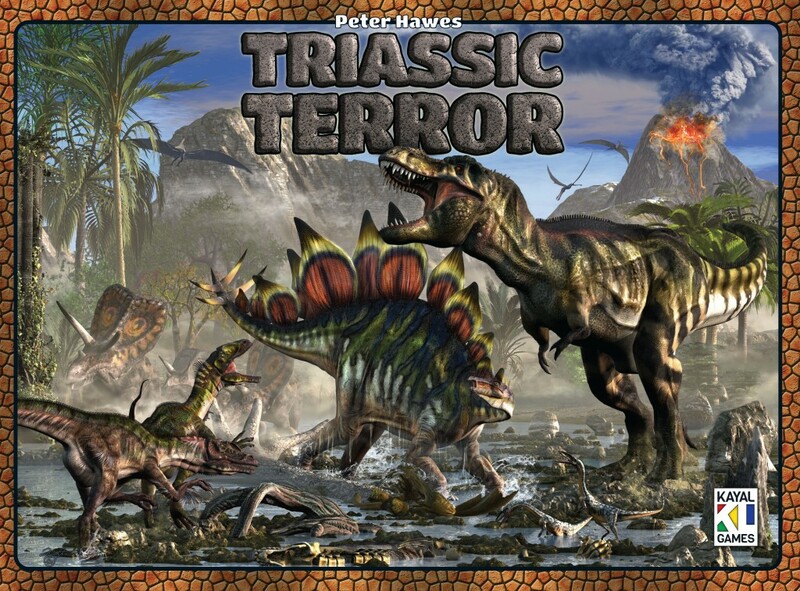 Triassic Terror is exactly how I want an area control game to play. Each player gets to make interesting moves every time it is their turn. Players are given equal access to each option on the map, there are several additional options available depending on the era and the types of cards in play, and you can EAT other players’ dinos with a T-Rex. Seriously, though, the game manages to find the perfect balance of speedy rounds, quick and interesting decisions, and limited damage when someone uses the predator actions against you. The risk of getting completely washed off the map, as so often happens in many other area control games, isn’t really here. This isn’t Dominant Species (which I also love, but for different reasons). It rewards you for being aggressive, but doesn’t punish other players for that aggression. It always gives them equal opportunity to fight back. The result is a constantly shifting carousel of herds moving into Primary Habitats and across the map, attempting to hold down the largest swaths of territory without spreading themselves so thin that they are easy pickings for a hungry Raptor or Pterodactyl. As I mentioned, this is a game I avoided for several years and at first I couldn’t really remember why. But the graphic design certainly doesn’t help from a shelf appeal perspective. The cover of the box, the rulebook, and much of the graphic design on the board and cards is a bit busy. The clean elegance of some other Eagle Gryphon games (especially recent favorite Francis Drake), isn’t here, and the result looks less polished. The game can also prove difficult in setup. Every player count requires a different setup. 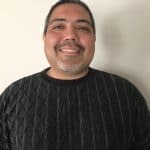 You start in different places, scoring options are different in each round, and the number of rounds you play is different. 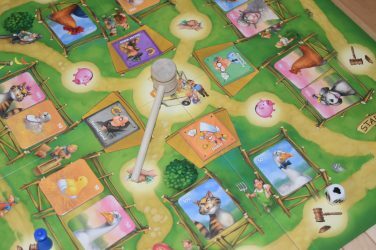 The game comes with handy player aids to help get all of this right, but it can still lead to some imbalanced plays if you miss one of the rules for setup. Combined with the likely AP that can bog down a game with larger player count (since predators can reach almost every corner of the map), and there can be some hiccups in players’ first games, even with the quick teaching time. As you can tell, my “Issues” with Triassic Terror are minimal. 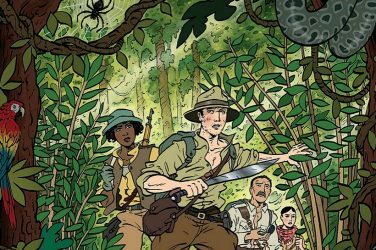 This is a very good game and a perfect example of how to take a no-brainer theme and match it with the perfect mechanism in a new and exciting way. Dinosaurs are a perfect cast for a brutal area control game, and the quality of components here, combined with the number of options you’ll have and the speed of the game (which you can play in less than an hour if everyone knows what they are doing), makes it that much better. Triassic Terror makes an immediate impact, and both thematically and mechanically impresses. 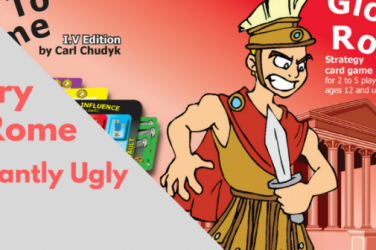 It’s exciting, fast-paced, and full of interesting decisions alongside tactical attack options that don’t overwhelm strategy. If you like area control, dinosaurs, or just smart game design, check this one out. Disclosure: Eagle Gryphon Games provided a copy of this game for review. 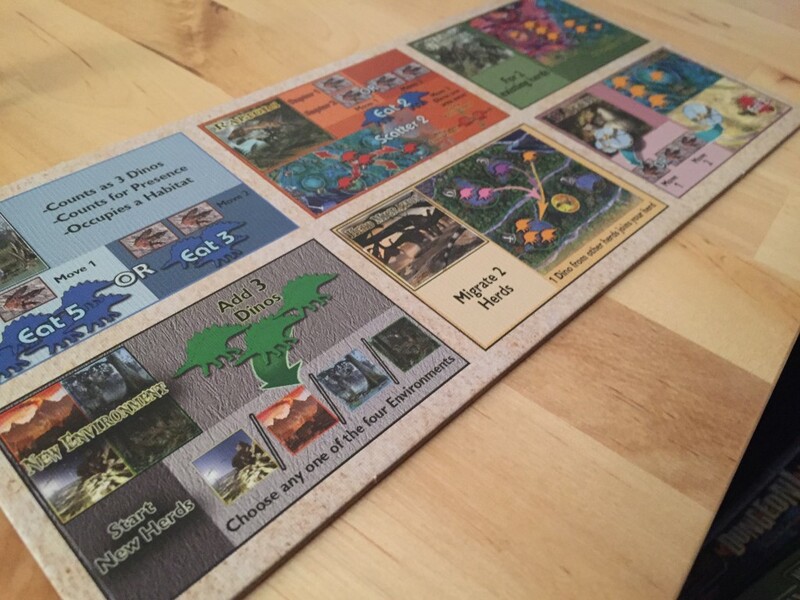 Triassic Terror is a sleek, easy to learn and quick to play area control game featuring dinosaurs competing for territory. 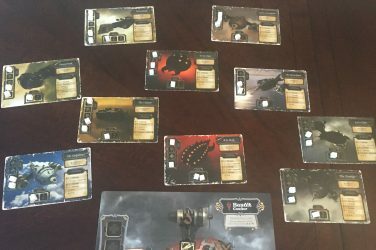 Spectacular components make for a great production that is a whole lot of fun to play and a must own for fans of the genre.